Since 2016, Citizen Lab and our partners R3D, SocialTic, and Article 19 have been conducting an investigation into the abuse of NSO Group’s government-exclusive spyware in Mexico. In six prior reports, published between August 2016 and August 2017, we identified abusive and potentially illegal infection attempts against multiple journalists, lawyers, international investigators, public health practitioners, senior politicians, and anti-corruption activists. 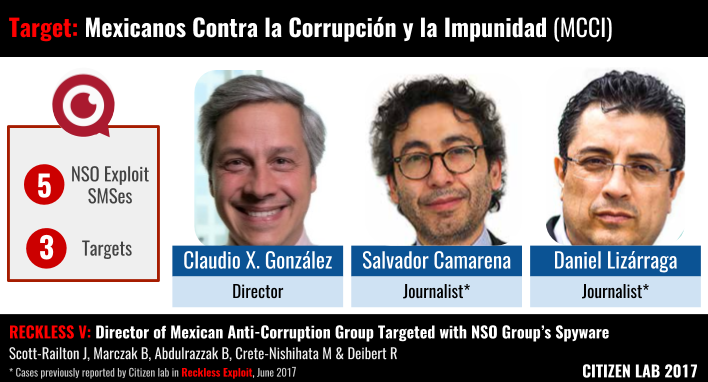 With this report, we are revealing the 22nd known individual abusively targeted with NSO’s spyware in Mexico: Claudio X. González, the director of Mexicanos Contra la Corrupción y la Impunidad (MCCI: Mexicans Against Impunity and Corruption). In recent years, González’s work, which includes founding MCCI, has focused on investigating and denouncing corruption in Mexico. González previously founded Mexicanos Primero (Mexicans First), an organization working on education issues. MCCI has conducted a number of high profile investigations, including work with the Panama Papers to scrutinize offshore holdings of prominent Mexicans and investigative work on corruption in areas like procurement and nepotism. In addition, MCCI conducts policy engagement on high-profile issues, such as anti-corruption legislation. In August and July 2016, while MCCI was engaged in advocacy around Mexico’s anti-corruption legislation, its director, Claudio X. González, received two text messages purporting to alert him that he was being discussed in El Universal and Proceso, two prominent Mexican publications. The SMSes were deceptions designed to trick him into clicking on links to NSO’s exploit framework. Clicking on the links would have resulted in the infection of his device with NSO’s Pegasus malware. Figure 1: MCCI director and staff targeted with NSO Group’s spyware (note that two of the cases were previously reported in Citizen Lab’s June 2017 report). Claudio X. González is not the first individual affiliated with MCCI to be targeted with NSO Group’s spyware. On June 19, 2016 Citizen Lab, in collaboration with R3D, SocialTic, and Article 19, published a report that revealed that Salvador Camarena and Daniel Lizárraga, two investigative journalists working with MCCI, were also targeted with infection attempts. Mexico struggles with corruption across federal and state governments and all major sectors. Mexico has the highest level of perceived public sector corruption among OECD countries, which impacts all sectors of Mexican society. While Mexico’s federal government has made some recent progress with anti-corruption legislation, the process is hampered by a lack of political will and harassment of organizations supporting the efforts. The cases of Mexico’s state governors highlight the twin problems of corruption and impunity in Mexican politics. According to MCCI, since 2000, of the 42 state governors suspected of corruption, only 17 were formally investigated, and four jailed. Four former governors, meanwhile, became fugitives. Concerns about the impunity of governors are high; most recently it was revealed that a fugitive former Mexican governor wanted on drug and money laundering charges continued to receive police protection. In a climate in which many believe anti-corruption efforts are met with a lack of political will, efforts to promote comprehensive anti-corruption legislation are further hampered by scandals at the highest levels of Mexican government. Even as the Mexican congress recently moved to pass anti-corruption legislation, the process was tarnished by accusations of legislative delay tactics and the legislation was stripped of key provisions. Meanwhile, organizations advocating against corruption have been the subject of a range of acts of harassment and intimidation. For example, several organizations, including MCCI, have been the targets of systematic audits, and others have been the victims of thefts, harassment, threats, and public denunciations. During the period of targeting, each organization was working on issues related to high level corruption in Mexico. In collaboration with Mexican NGOs R3D, SocialTic, and Article 19, Citizen Lab examined messages sent to Claudio X. González, and confirmed that he was targeted with NSO’s spyware. On July 27 and August 2 2016, González received text messages as part of a ruse to trick him into clicking on malicious links. If clicked, the messages would have infected his device with NSO Group’s Pegasus spyware. The first message, received on July 27th 2016, claimed that he was the subject of negative press coverage by major Mexican newsmagazine, Proceso. The second message, which arrived a few days later on August 2nd, used a similar ruse, but spoke of negative coverage in the newspaper El Universal. The full text of the messages, as well as additional metadata are in Appendix A. Figure 4: Text messages with infection attempts sent to Claudio X. González, director of anti-corruption organization MCCI. Both links were shortened with bit.ly, and pointed to the domain smsmensaje[. ]mx, a domain that is part of NSO’s exploit framework, and has been present in many of our previous investigations of NSO abuse in Mexico. Clicking on the shortened links in either messages would have resulted in a redirection to the NSO Group’s exploit framework, and the silent infection of González’s device with Pegasus spyware. Figure 5: Publicly available data from the bit.ly shortener shows that the NSO exploit links were shortened by the operator on the same dates that the messages were received by González. Publicly available data from the bit.ly shortener confirms that the NSO links were shortened on the same days that the messages were reported received (July 27 and August 2, 2016). We first identified the smsmensaje[. ]mx domain while performing internet scanning for unique fingerprints belonging to NSO’s exploit infrastructure. Subsequent to the original find, we have consistently identified this domain in each of the cases established as part of our investigation into the Mexican case (reports: 1, 2, 3, 4, 5). As shown in our prior investigations, a target clicking on the link would be infected using a chain of zero-day exploits against the operating system. Analyses have now been published on both NSO’s iPhone and Android implants. 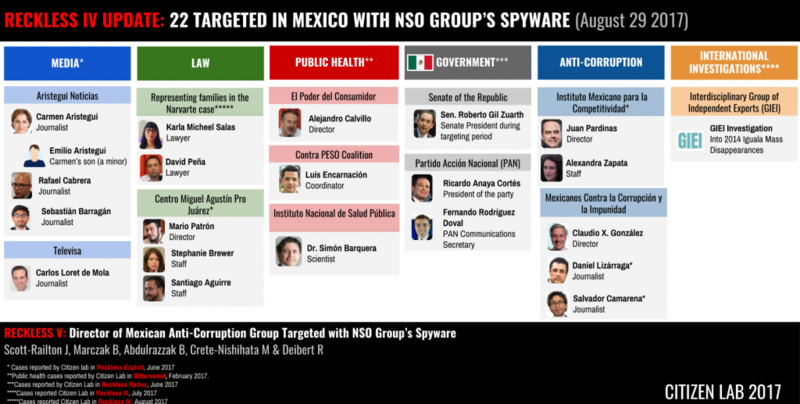 The targeting of Claudio X. González, director of anti-corruption organization MCCI, marks the 22nd documented case in Mexico in which NSO Group’s Pegasus spyware has been used in infection attempts. As with the previous cases, this incident was identified in cooperation with our partners R3D, SocialTic, and Article 19. At the time of writing, our investigations have revealed targets that include multiple journalists, lawyers, international investigators, public health practitioners, senior politicians, and anti-corruption activists. Previous reports highlighted a pattern of targeted infection attempts against journalists and investigators who questioned government accounts of suspicious killings. This report highlights what appears to be a second, troubling pattern: systematic targeting of organizations focused on issues of corruption (Aristegui Noticias, MCCI, and IMCO). Just as was the case with those investigating the killings, the digital targeting of anti-corruption groups compounds the widely-reported patterns of harassment against civil society organizations. Our technical methods do not permit us to conclusively attribute these operations to a particular customer. However, each finding, as well as extensive investigations by Mexican organizations, contribute to the mounting circumstantial evidence pointing to an entity or entities within Government of Mexico as the NSO Group customer(s) responsible for these abuses. Moreover, leaks show that the Mexican office of the prosecutor is an NSO Group customer, and, although he denied that the spyware was being abused, the Mexican President has also publicly admitted that the Mexican government has also purchased the technology. As case after case emerges, it has become a matter of public record that NSO Group has serious problems with oversight and control of its offensive technology, and has been unable to prevent customers from committing abuses and possibly illegal activities. To date, there is evidence of systematic abuse of NSO’s spyware in two countries, Mexico and Panama, and further evidence of abuse in the United Arab Emirates showing that at least three of NSO Group’s governmental customers have seriously abused their product. These cases have led to ongoing governmental investigations (in Mexico and Panama), and numerous calls for further investigation by international bodies. In addition, there is evidence of likely-illegal cross-border targeting into the United States, and the targeting of United States Embassy personnel and American citizens. Nevertheless, NSO Group has reportedly attracted investment interest from US firms, even as more cases of the targeting of Americans come to light. Recently, NSO Group and its majority owner, Francisco Partners, were reportedly negotiating the sale of a 40% stake to investors led by Blackstone Group L.P (NYSE: BX). That negotiation has reportedly fallen through amid questions about human rights and due diligence from Citizen Lab and civil society groups R3D, SocialTic, Article 19, Consumer Power, Centro PRODH, Access Now, and Business and Human Rights Group. This report, and our six previous reports on abuses of NSO Group’s spyware that have come before it, a growing body of research from many other groups, and other ongoing investigations, make it clear that the market for “lawful intercept” and “government exclusive” surveillance technologies has a fundamental problem of oversight. None of the widely-known sellers of this technology (Hacking Team, Gamma Group, and NSO Group) have shown the will, or the capability, to prevent abuses. Any investor exploring the possibility of acquiring a stake in developers of government-exclusive spyware like NSO Group must reckon with this reality, and the substantial business, due diligence, and human rights risks that come with it. Citizen Lab would like to thank Claudio X. González who, along with the other targets that have participated in this investigation, make these investigations possible by consenting to share the targeting. Special thanks to the teams at Article 19, R3D, SocialTic, for their careful and important investigative work. We would like to especially thank and highlight the exceptional contribution of Luis Fernando García at R3D in this investigation. Thanks to the whole Citizen Lab team, especially Christine Schoellhorn, Miles Kenyon, and Adam Senft.